Thank you for your service and your sacrifice, Detective Simonsen. Rest in Peace now, Brother. We've got the watch. RIP Detective Simonsen. My sympathies are with your family, colleagues and friends. “ There , but for the grace of God , go I “ . On behalf of the Klamath County Sheriff's Office in Klamath Falls Oregon, we send our sincerest sympathy in the recent loss of your Detective, Brian Simonsen, in the line of duty. It is always a huge loss when a fellow detective makes the ultimate sacrifice. His bravery and courage to protect and serve your community has not gone unnoticed. Also our thoughts and prayers to the Sergeant that was wounded for a safe and speedy recovery. On behalf of the Hillsborough County Sheriff's Office Honor Guard, we send our deepest sympathies and condolences. R.I.P. Detective Simonsen, may God bless you and keep you. May God comfort your family, friends and all our brothers and sisters with the New York City Police Department. May God wrap you in his loving arms and grant your family and friends strength, comfort and peace during this difficult time. We will keep you all in our thoughts and prayers my brother. Please know that you and your service will never be forgotten. Fidelis Ad Mortem my brother as we remain Standing Tall For Those Who Have Fallen. We have the watch from here. Rest in peace Detective Simonsen. My dad may he too rest in peace worked out of the 102nd precinct between 1928 and 1966. Forever a humble and honored hero! RIP HERO. THOUGHTS AND PRAYERS FOR YOUR FAMILY AND ALL INVOLVED. SINCE THIS WAS S TRAGIC FRIENDLY FIRE INCIDENT PLEASE PRAY FOR ALL OFFICERS WHO FIRED THERE WEAPONS. God Bless! Rest In Peace Detective Simonsen# 3877. Thank you for your service and sacrifice. Rest In Peace Detective Simonsen. Our deepest heartfelt condolences to all of your family, friends, and brothers and sisters at New York Police Department. Heartfelt condolences to the family and colleagues of Brother Simonsen. NYPD has lost a true warrior and gentleman. May he rest in peace and take his place in Valhalla among those heroic women and men whose life mission was to serve and protect. 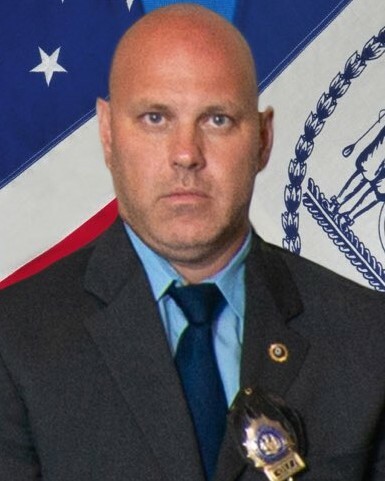 Deepest Sympathy to the family of Detective Simonsen And to his Brothers and Sisters of the NYPD New York City May God Bless him and keep him in His Loving care.